Human beings can never be satisfied. Russell is a normal human being like everyone else, if Ciara, Future, Russell and Future jnr weren't popular media personalities, nobody would be concerned with Future's son calling Russell papa. These people that are complaining and hating on Ciara and Russell's happiness, Why don't you'll call out the Kardashian siblings when they call Bruce/ Caitlyn Jenner Papa/ Mama. These haters should free Ciara and Russell abeg. Why do you want the boy to be confused by not calling his step dad, papa, should he say step papa? He doesn't understand all these. He has two dads now whether Future likes it or not, Russell is now Future Jnr's dad too, and father/papa/dad don't mean someone that donated sperm to produce a child, it's far from that. 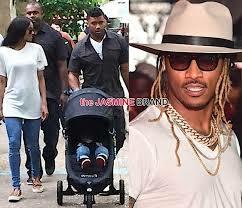 Ciara is happy that Russell is a good dad to her son, he's not being maltreated, and I am not saying Future is a bad dad before them haters formulate something else. I just had to say mind on this ongoing issue, Future and his fans should just let Ciara be happy. If he's son is unhappy, he should sue them with proof and stop dragging her name and her husband's name anyhow...Goodnight y'all.